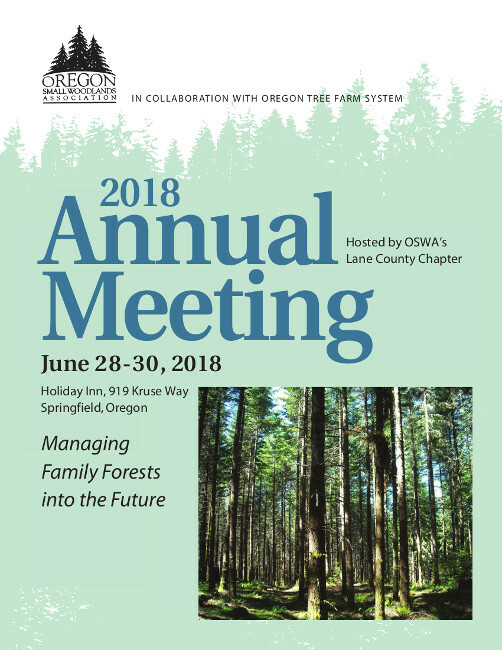 Oregon Small Woodlands Association’s 2018 Annual Meeting is Thursday, June 28th through Saturday, June 30th at the Holiday Inn, 919 Kruse Way, in Springfield. There are discount rates for participants. OSWA’s Lane County has done a great of preparing for a great meeting. The theme is “Managing Family Forests into the Future”. Thursday afternoon, local mill tours will be available for the first 80 people who register for mill tours and Friday’s program and Awards Banquet will focus on issues important to family forest owners. It will be topped off with a Saturday morning woods tour of 2017 Oregon Outstanding Tree Farmers of the Year Steve and Wylda Cafferata’s Cafferata Family Forest. Everyone is welcome. Advanced registration is required. See Annual Meeting Brochure for details.